Happy Sunday, all! Are you watching the Super Bowl today? DH will be, but I will probably be knitting or sewing or something....until Downton Abbey comes on, anyway! 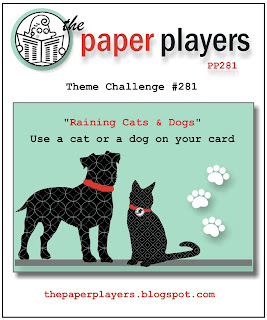 Today is my turn to host the Paper Players challenge, and I've chosen the theme of "Raining Cats and Dogs"....to use a dog or cat on your creation! Strawberry Slush was used for the diagonal piece, and I did a little piercing on it, and gave my stamped image a double mat of So Saffron and Bermuda Bay. The final touch was a stitched heart and some baker's twine. I love these bright colors....And the row of cats is so sweet! You made my sketch look fabulous! Cassidy looks like she just got a new style as well......cute! What a sweet card, LeAnne! Love the sentiment you chose for you card too!! Hope you have a great week! You know I went immediately to find those darling cats, LeAnne! LOve the calico, though I am a bit more drawn to a tabby, he does color so beautifully! Darling card!!! My thinking cap is ON, and I'll be watching Downton, too! Boo football... did I say that out loud? Cassidy looks so grown up with her new hair style. What a sweet quartet of kitties - love their mottled colouring! Perfect for this week's challenge. Great choice of background paper too. Enjoy your day of crafting - and your Downton Abbey fix! I am having a good time visiting the blogs and seeing all the cute cat and dog cards...fun challenge LeAnne! Your row of cats is adorable, and I like the papers you chose,too! Cassidy looks as cute as can be playing hairstylist! Have a fun day whichever craft you decide to do! You already know I love this challenge LeAnne, and I also love your cute kitty back-sides! So adorable, and I especially like how you stamped and colored them on patterned paper. Cassidy looks so grown up with her beautiful haircut! Purr-fect, LeAnne! I love that row of cats and they look fantastic with the DSP, so cute! Cassidy's new do is adorable too. OMG has Cassidy grown up!!!! What a sweet little lady!! Ooooops!!! I love your card too!! LOL!!! All those sweet little kitties!!! Thank you for playing with us over at the Pals Paper Arts this week!!! Love those kitties and my SIL would too! They now have 5 cats and her husband is allergic!! But he's the one who keeps bringing them home LOL...go figure!! The colors in that DSP is beautiful....fun and beautiful! I would say that this is one PURRRRRfect card! Thanks for playing this week! Oh my gosh, LeAnne...This kitty stamp is the cat's meaow! What an adorable card. Thank you for joining the PPA Sketch Team this week, my friend! Couldn't love this card any more! I'm a cat lover and will go buy this kitty stamp today. So cute, LeAnne! I wonder what they are watching, LOL. Super cute card, LeAnne. Love the patterned papers. LeAnne, I love this challenge! Those kitties are just wonderful and I love the black, flower DSP in the background. that heart with the twine is just the perfect finishing touch. Hello LeAnne: So sorry for the lateness of this comment but I wanted to thank you for this fun challenge. Your image is so beautiful, love this row of cats looking out the window. I'm a cat person so I went to look for this stamp and I found it, it's just so sweet. Love the beautiful design of your card, that DSP is just gorgeous. Thank you again for this fun challenge.